← Get your best body EVER – In TWO SECONDS! In my workouts I rarely ever include crunches. If I put them in, they are generally meant as sort of an active rest station. And I only use ones that are full body like the super crunches. 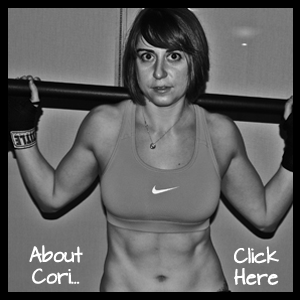 Here by the way are the super crunches from Saturday’s Bikini Workouts Post. Crunch up and reach outside your legs. Go back down and crunch up reaching one hand inside. Perform a third crunch reaching the other hand inside. That is one super crunch. In general though, crunches are worthless and I don’t include them. But that doesn’t mean I think core work isn’t important. Because it is! Heck I’ve even done another post about core exercises even though I did one pretty recently called 10 Core Moves. If you want to work your core, do it in a way that has either some functional benefit OR that works a ton of different muscle groups at once so you get a big bang for your buck. Below are a variety of great moves that work more than just your abs and are functional. I’ve included both rotational moves that will help you be strong when lifting something and twisting and anti-rotational moves that will help you prevent injury when trying to resist a rotational force. Some of these moves are very core specific and some actually are “focused” on working another muscle group but do A LOT to strengthen your core. 1. XT Strap Anti-Rotational Row – A great single limb movement that allows you to work each side of your back individually while also working your core. You can do this on the XT straps or even off a barbell in a rack. To do this move, place one hand across your chest and grab the strap in the other hand. Set up in a nice straight line, squeezing your quads, glutes and core. DO NOT let your body rotate. You want to move in a straight line as you row up and down. You are fighting your body’s desire rotate. You should move as if both arms are pulling instead of letting the side not rowing rotate open toward the ground. To advance (or regress this move), change the incline of your body. The closer you get to parallel to the ground, the harder the move gets. 2. XT Strap Rotational Row – In the other single arm row, we are fighting rotation. In this one we are working with rotation to row up. During this move, grab one strap in one hand. Reach the other hand up the strap as high as you can. Then rotate that hand toward the ground almost as if you are doing a hanging side plank. Keep your body in a straight line and don’t let the hips sag toward the ground. Keeping the core tight, rotate back to the start. To advance (or regress this move), change the incline of your body. The closer you get to parallel to the ground, the harder the move gets. 3. Mountain Climbers – I’ve shown these before on the towels. They can also be done simply on the ground to make them easier. Today, I did them in the XT straps, which creates a bit more instability. Put your feet into the straps and set up in a high plank. Run your knees into your chest without losing control so that your feet shoot out everywhere. You can also bring your knees across your body or to the outside of your elbow to hit slightly different areas of your core! 4. Rotational Knee Tucks – These knee tucks can also be done as straight leg pikes, but for today I just showed the tucks. Like mountain climbers, they can also be done where you just bring your knees straight into your chest. However, they are a great rotational move so that is the one I showed today. Set up in a high plank with your feet in the straps. Alternate bringing your knees to each elbow. Try to really get the knees to the elbow or outside to really work the rotation. If you are a beginner, you may want to do this move on the ground by jumping your feet in and back. You can also do this move on the towels! 5. Side plank – I showed a couple of variations of the side plank in my vacation workout a week ago, but you can also do one in the XT Straps. Using the straps creates a lot more instability so that you have to fight more to keep from rotating or collapsing. A great way to progress the side plank. 6. XT Strap “Ab roller” – Moves with this are great because they teach us to engage our core to support our back even when we are reaching for something. You can do this move on an ab roller. The bodysaw and the band pull below are two other moves that work the body in a similar way. To do this move, put each hand in a strap. Lean into the straps and straighten your arms fully. Bring them above your head and then back down to your shoulders. The closer to parallel to the ground you are, the harder the move will become. You should not feel this move in your low back. You should feel this move in your abs, arms and quads. 7. 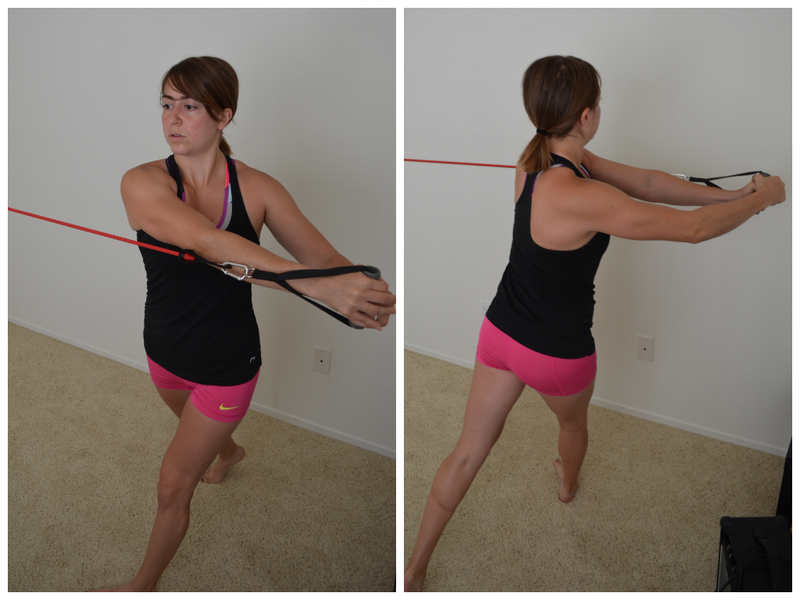 Band Stability Press – One of my favorite anti-rotational moves. You feel this all down the side closest to the anchor point of the band. You can also do this on a cable pulley machine. Step away from the anchor point as far as you can without allowing your body to rotate towards the anchor. Start with the handle at your chest. Push the band straight out from the center of your chest until your arms are straight. Do not let your arms go back toward the anchor. Then slowly bring your arms back in. This move looks easy, but when you try it, you realize how much your entire body fights rotating back toward the band hook! 8. Band Rotations (Shoulder to Shoulder and High to Low) – These were some of my favorite moves in college. We used to do them a lot with medicine balls, which I loved. But since I can’t slam a medicine ball into the wall of my house….I do these with bands. Keeping your core tight and your shoulders down and back, rotate the band from side to side keeping your arms fairly straight. You can either rotate side to side at shoulder height or you can rotate the band down outside your hip. With both, make sure to rotate the back foot so that you are twisting your knee in a funny direction. With pulling the band down outside your hip, you will want to get more of a squat/lunge in than you will with the shoulder height rotation. Both are great, just different variations that target slightly different muscles. 9. 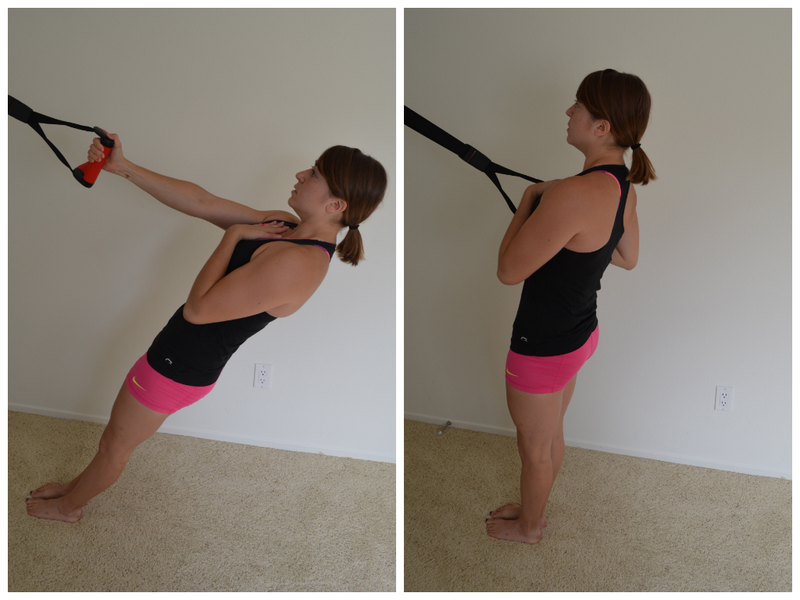 Band Reach – So this is the move that works the body in a similar way to the ab roller. It reminds me of that extension at the top of an overhead medball slam. It helps strengthen that extension so that your core is strong at that range of motion and so that your lats are even working to help stabilize and generate power. Kneeling, allow the band to pull you back. 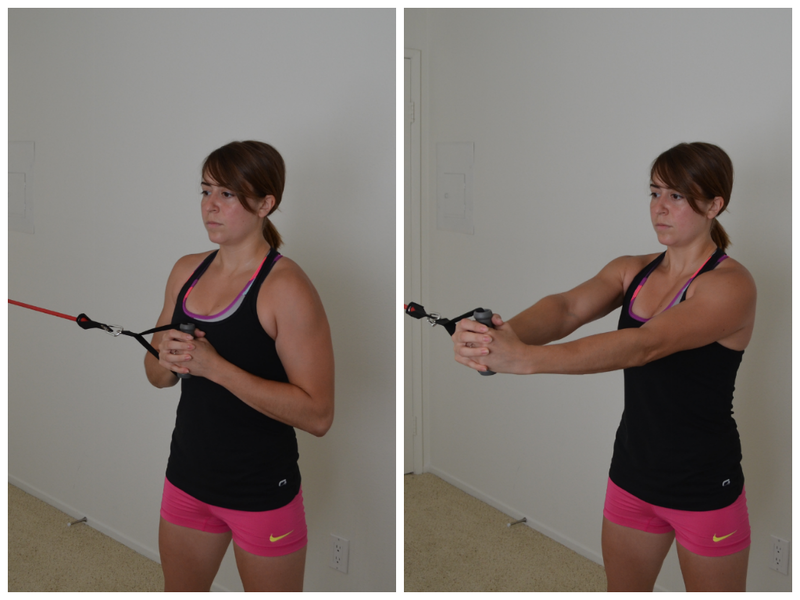 Then using your lats and core, press the band back forward. It isn’t a huge range of motion, but you will feel your abs working to stabilize especially as you allow yourself to be pulled back! 10. Front Squat – Potentially my favorite move on the list. The front squat works your legs AND your core. Any time you front load, be it a kettlebell, barbell or sandbag, you cause your core to engage to hold you upright. Seriously feel my core working so hard every time I do these. LOVE IT! Works a major muscle group, is incredibly functional and forces your core to really brace and stabilize during a functional movement! I didn’t take pictures of these moves because I just recently featured them in my towel workout or hotel room workout posts. But I did want to make note that these are also great CORE moves so that you could see just how many different great moves really worked your core. There are so many great core moves that have so much more benefit than crunches! So are you still going to waste time on upper or lower isolated crunch moves!?! Posted on July 8, 2013, in Top 10, Workout and tagged ab crunches, core exercises, core moves, functional benefit, xt straps. Bookmark the permalink. 2 Comments.